When I first saw Steven Spielberg’s classic, JURASSIC PARK, I was but a young, 16-year-old boy. Aside from a total lack of interest in paleontology, I was the ideal demographic to devour this incredible blockbuster, and that is exactly what I did at the time. I didn’t go so far as to bring a JURASSIC PARK lunchbox to school, as I was not fond of being beaten up, but I did see the film a few times in theatres just for the sheer fun of it. That’s what JURASSIC PARK was to me at the time – just pure, awesome entertainment. 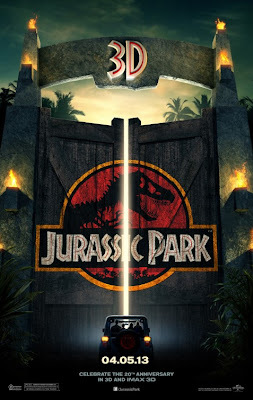 Well, it has been 20 years since JURASSIC PARK smashed box office records around the world and the film has now been converted to the 3D format, a format it almost certainly would have been shot in if it were made today, and one that suits it quite well. The question now becomes whether or not a film that once floored a global audience should have been dug up at all or whether they should have been left fossilized as perfection in our minds. Out of the entire 127-minute running time, dinosaurs only appear on screen in JURASSIC PARK for all of 15 minutes. Being amazed by them, running from them, getting eaten by them, is actually such a minute part of the film when you break it down but their presence is so massively impressive that the fear and wonder they inspire permeates the entire experience. 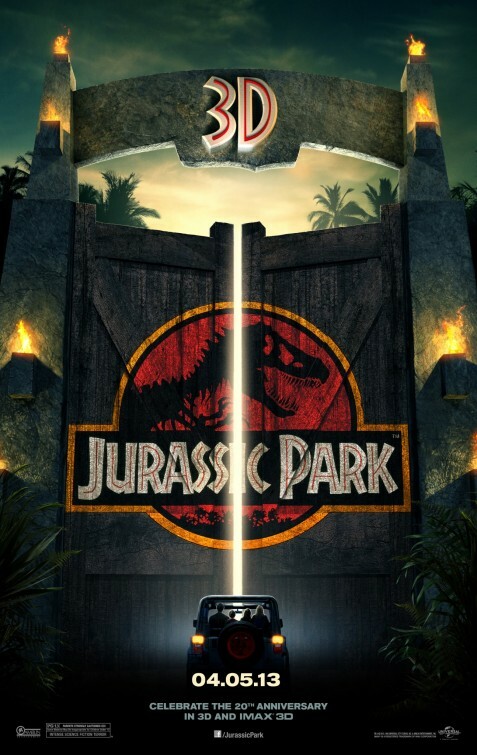 For those who don’t remember, “Jurassic Park”, a theme park that features genetically cloned, live dinosaurs as its main attraction, is being previewed to a handful of scientists and children to assess whether the park is ready, or rather safe enough, to open its doors to the public. Of course, it isn’t safe, but then again, how could it be? These are dinosaurs after all; they are a great deal larger than we are and, as is pointed out repeatedly in the film, man and dinosaur never inhabited this planet at the same time. There was probably a very good reason for this. With 20 years growth of my own since I first saw JURASSIC PARK, I did pick up on a thing or two I might have missed when I first saw it. Firstly, while the Stan Winston animatronics and the Industrial Light & Magic CGI, are clearly the most visible heroes of the film, it is director, Steven Spielberg’s story telling strength that allows JURASSIC PARK to continue to enthrall and excite so many years later. The effects definitely hold up but Spielberg is constantly establishing and introducing elements that create tension and intrigue that is entirely separate from the dinosaurs themselves. One moment, he allows the chaos that has overrun the park to stop so characters can debate the grander implications of scientists playing God, and the next, he is mocking his own choices as director, with bits about avoiding animatronics at all costs in the park (which actually make up 9 out of the 15 dinosaur minutes in the film) and cheekily juxtaposing the profit possibilities of this endeavour with the film itself. Spielberg understands implicitly that he is at the helm of an incredibly enormous and toothy machine here, and by pulling JURASSIC PARK off, he easily justifies his own God complex. How many sheep would you give Jurassic Park? You’re obviously enthusiastic about the 3D revision, but your review never answers the question that you pose in the first paragraph. Indeed, everything you’ve written applies equally well to the original 2D version. Was the 3D an enhancement worth experiencing? Isn’t Spielberg contradicting his philosophy that “every single movie is a signpost of its time, and it should stand for that. We shouldn’t go back and change the parting of the Red Sea in The Ten Commandments just because with different tools we can make that even more spectacular than it was.”? Thanks for the comment! I think I answered the question that the film holds up well. I wasn’t necessarily trying to critique the conversion itself but rather just how the film holds up 20 years later. I do actually think the conversion worked quite well most of the time. It was occasionally difficult to assess the overall quality of the dinosaurs through the 3D fog but like I said in my review, the excitement in this film does not just stem from the dinosaurs themselves. As for Spielberg’s stance on not messing with films, I guess his logic doesn’t apply to 3D. Perhaps he is referring more specifically to not touching up the quality of the dinosaur effects. This way, they are a reflection of the time but just in a different format.